This article is for the business owners and production managers who generally ignore to look into production data. They are unaware how much money they are losing daily due to low line performance. This is a case of a garment export manufacturer. I was in a meeting discussing about line efficiency, present cost per pieces and what the production people can achieve to lower down the making cost. When we started discussing the fact and figures everybody was surprised. Read the following figures to know what the surprising thing was. 45 operators work 11 hours day in producing those pieces. So, present labor cost per piece = (Total cost of operators/number of pieces produced) = (40*24*11)/300 INR = 35.64 INR. It seems fine. According the standard minutes (SAM value of the garment), if line performs at 100% efficiency then it would cost factory = (24*23/60) = 9.20 INR per pieces [cost per hour *SAM/60]. 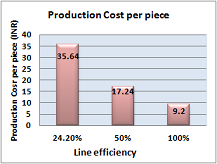 Even if the factory hits average line efficiency to 50% operator cost per pieces become = 9.2*100/50 =18.40 INR. There is a big difference between current performance and what is expected. Suppose the factory reach at 50% average efficiency then factory owner can save net 17.24 (35.64 –18.40) INR per pieces. In an order of 15000 pieces, factory will save approximately 258,600 INR in this order. These figures are all real and can be achieved if you know how to achieve the target efficiency. Now question is that how to improve the line efficiency. Total working hours in a day are fixed. You have to produce more minutes or more pieces to increase the efficiency within those hours. The initial steps to start improving line performance are listed below. Increase operator utilization by balancing the line and eliminating off-standard works or minimizing lost time. If you have good team of industrial engineers, they can work on the above to meet your target (lowering the production cost). Otherwise you can seek for professional help. Now-a-days you will find many freelancers who can help you saving more money at your factory day by day. Online Clothing Study: How to control apparel production cost?